Homeowners and business property owners love white marble. Its shimmering appearance is quite dazzling, and the light shade works well when set against darkly toned furniture and appliances. The most often-asked question regarding white marble concerns its durability and resistance to color fading. Polished marble will resist fading and absorption of moisture better than a stone that has been honed. However, remember that all marble will slowly absorb water or other liquids. The process is slow, meaning that the stain will not show immediately. Marble will last for years without fading or discoloration so long as any moisture is removed from the surface immediately. Stonexchange is a Miami-based importer and distributor of natural stone materials for the home and business. We specialize in flooring tiles, transition thresholds, window sills, and travertine shower accessories. Our line of natural marble stone tiles is featured on the Nalboor Tiles website. Nalboor Tiles has introduced a new line of lightly shaded marble tiles that are a perfect replacement for some of the better-known styles and colors. Our white marble tiles originated as large slabs taken from quarries, have been expertly fabricated and polished, and are available to the public at wholesale prices when purchased in bulk. We invite interested parties to check out our premier Bianco Dolomiti, Vanilla Oro, and Nuovo Crema Marfil floor tiles, each of which is similar in shade and veining style to some of the more expensive tiles manufactured from quarried marble in the Mediterranean region. White marble is a favorite among homeowners for use as both a floor and wall covering. This style of marble is popular for use in the kitchen and bathroom. White marble looks its best when the complementing shades are somewhat darker. Mixing white marble with medium or neutral shades generally results in an annoyingly drab interior atmosphere. Kitchens designed with a white tile floor and backsplash often have darkly stained wood cabinetry. The appliances also have darker tones. A coal, mud, or black shaded range and oven looks fantastic when set above a white marble floor and below a white marble backsplash. A dining table made from dark-shaded hardwood and set with a glass top surface will look beautiful above a white marble floor. Silver and polished steel also stand out well against a brilliant white background of marble. Bathrooms are often designed with jewel tones, meaning a great deal of silver, black, blue and green shades are used. Shiny mirrors with polished steel or aluminum edges, polished steel vases, silver or black shower curtain rings, and blue or green towels will complement a white marble floor very nicely. White marble generally has a high degree of reflectivity, meaning that the interior lighting can be toned down quite a bit. In other words, 100-watt light bulbs are usually unnecessary when white marble is used as the room’s primary accent. White marble stands out better when natural light is allowed to flood in from the outdoors. Marble needs to be sealed to help prevent moisture absorption and scuffing. This sealing procedure needs to be performed when the marble is installed as well as once again every two or three years. However, even sealed marble will absorb moisture. This absorption is virtually unnoticeable because the natural cracks and inclusions in marble are very tiny. Seepage does occur however, as anyone who has left a wine or juice stain set on marble tiles can attest. Over a period of 12-24 hours, the color of the liquid will find its way into the stone, and removing it later may result in permanent damage to the surface of the stone. Therefore, the first rule of marble maintenance is to wipe up any spills immediately. Repolishing and resealing the marble every so often will also prevent any small scuff marks to stand out and become noticeable. Repolishing also prevents small abrasions from becoming large cracks if the marble tiles are placed in areas of high foot traffic. 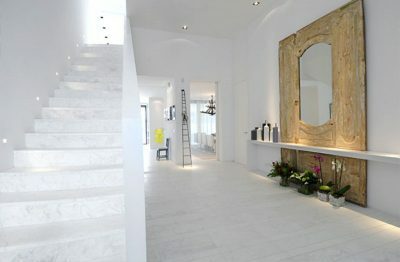 Flooring product retailers will have a showroom full of white and off-white marble tiles for the home. Each of these will either have a trade name attached to it or will be specified as belonging to one of several classifications of marble. These names are familiar to those who install marble for a living. Stonexchange has produced a line of white and off-white marble tiles that are a perfect match or replacement for these styles. All are displayed on the product pages of the Nalboor Tiles website. The price of these tiles varies according to the amount of material purchased. This price variance reflects the importation costs and freight charges associated with transporting marble from the quarry to the fabrication center and on to its final destination. Stonexchange specializes in bulk-quantity orders for all of its marble, granite, and travertine products. In order to make our line of brilliantly crafted floor tiles more affordable, we promote a low price when hundreds of tiles are purchased by the end-user. This does not mean that the buyer will spend a huge amount of money when purchasing smaller quantities of material. Stonexchange is a truly wholesale import and distribution operation, meaning that all who purchase natural stone material from us will save big when compared to retail prices found in merchant locations. Bianco Dolomiti is a very light shade of marble with a small amount of medium-shaded streak patterns. This product is very similar to the famed Calacatta marble quarried in Greece. It is available in both standard and non-standard sizes. Vanilla Oro is a cream/ivory shade that has creamy beige streak patterns. This tile looks great when used as a kitchen backsplash or as a covering for a shower stall. It is available in 18-inch and 24-inch square pieces. Nuovo Crema Marfil is a slightly darker marble. Its cream and beige tone is highlighted with medium shades of streak patterns. It is also rather milky in appearance and works well as a floor tile or as a bathroom wall covering. It is available in 12-inch, 18-inch, and 24-inch square tiles. All of the styles mentioned above are kept in inventory at the Stonexchange warehouse and distribution center. The standard sizes given reflect the demand trends in the industry. However, Nalboor Tiles and Stonexchange will gladly consider fabricating custom-size tiles for our customers at no extra per-square-foot charge. When contracting an installer for the placement of marble stone, consideration of the material cost is foremost on the mind of the homeowner. The actual cost charged by the installer depends heavily on how much the marble itself will cost. Finding a suitable source of premium-quality marble stone is easy. The name to remember is Nalboor Tiles. Stonexchange contracts with various overland freight companies to deliver all of the products listed on the Nalboor Tiles product pages. We maintain a huge inventory of all the styles mentioned above. Our company can pack together an order and have it on its way to the customer in as little as one or two business days. Stonexchange carries other natural stone products in addition to our famous line of marble tiles. Complete home renovation or remodeling projects calling for the use of marble, granite or travertine means ordering several different types of material. We can mix the order to include marble or granite window sills, floor transition thresholds, and even travertine wall surface coverings. Remember, the larger the order size on marble tiles, the greater the savings. Professional installers charged with the job of placing marble tiles for a client will probably have other ongoing projects. It saves both the homeowner and the installer money when product is ordered in bulk. Stonexchange and Nalboor Tiles have a staff of knowledgeable service representatives who can listen to your design idea and create an affordable purchase package. We not only offer the finest marble products in the industry, we make them available to homeowners, merchants, installers, and construction companies at prices that are truly wholesale. Contact us today and learn just how affordable white marble is. This is the first step in transforming the bath, kitchen, or living area into a palatial interior environment.